Aquariums enhance the look and feel of a home. They provide a vibrant touch to home décor and it can be the center of attraction in any home. Some people consider aquariums as a conversational piece in homes. Now, making the aquarium striking, interesting, colorful and decorative is no easy job. Among others, one suggestion every fish lover has up his sleeve is the addition of colorful fish and what better than a Discus Fish. Here are discus fish facts that should help you. The Discus fish derives its name from the shape which is round and laterally flat just like a Discus. The Discus fish come in a variety of colors, shades and variations. Colors include green, red, brown, and blue. The unique shape, unique patterns and color contrast make this a very popular fish in the aquarium. Think about a Discuss Fish tank of instance. The popularity of the fish has also made it prone to some artificial breeding, giving out more and more color variations and making it a must have fish in your aquarium. The size of the Discus Fish is also an advantage for all types of aquariums as they grow just up to 15.2 cm in length and weigh up to 250 grams. Like in most of the animal kingdom, the male fish are generally larger in size than the female ones. The Discus Fish is generally known as being native to South America is found in the floodplain lakes and rivers in the lowland Amazon River. The Discus Fish belongs to the Cichlidae family and Symphysodon Genus. Infact the Discus is also known as the Symphysodon or the pompadour fish. There are mainly three Discus Fish types, the Blue or brown colour one is known as the Symphysodon aequifasciatus Pellegrin generally found largely in blackwater habitats. The red colour ones are known as Symphysodon discus Heckel are generally found in black and white water habitats, and the green ones are known as Symphysodontarzoo which are found in black and white water habitats and Clearwater. The Discus are generally found in large schools. They are very social in their behavior. They get along with other fishes very well. This also is another feature that makes them a must want fish in your aquarium. The Discus fish generally eats algae, insects, crustaceans, mollusks, and worms that live in water. In aquariums discus fish eat high quality flake food, pellets, blood worms, black worms and beef heart. Discus fish require a high protein diet. Discus Fish breeding happens away from the school and take care of their young ones for about 2 weeks. Not very uncommon, but the Discuss feeds its young ones from a secretion that comes out through the skin. The parent discus will darken in color a develop a white mucus film over it’s skin that the fry will eat. During this stage it is very critical that you keep a close eye on the fish. Start introducing baby brine shrimp to wean the fry off the parents before they start scarring the parents skin. Once the fry are eating on their own and no longer attached to the parents then you can move the fry to their own grown out tank. Discus have the reputation of being very difficult to keep. That is far from the truth. While discus are not for beginners that are fairly easy to keep as long as you have the proper elements and routine in place. Discus require very clean water. Therefore it is critical that you have the proper filtration. In addition you must be able to dedicate time to performing water changes. The frequency and amount of water that you will need to change will depend on many factors including size of the aquarium, type of substrate being used, the amount of discus fish in the aquarium and the amount of plants and decorations in the aquarium. Unlike many rumors you will read online, it is not necessary to do water changes daily unless you are breeding discus. When you breed discus you have to do a least one water change per day at the minimum. Discus fish are very compatible with other fish. They are slow moving fish so they like to be with other slow moving fish. Discus fish are also schooling fish. They feel safer in large numbers. Therefore it is highly recommended that you keep discus in groups of 6 or more. If you are hoping to get a breeding pair of discus then it is recommended that you get at least 12 discus fish. The odds of two of them pairing up is very likely. Unlike your regular freshwater fish discus prefer warmer water. The best temperature to keep your discus in is 86F degrees. A safe temperature range is 84F to 86F degrees. Therefore you need to take caution what other fish you put in your discus aquarium being that your typical freshwater fish cannot survive in warmer waters. Discus can survive in temperatures up to 90F degrees. However it is not recommended that you keep the water temperature above 86F degrees. 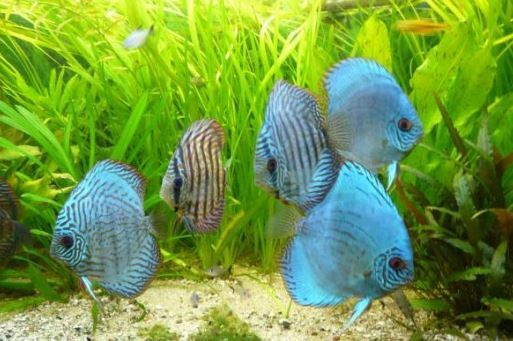 I hope you found these discus fish facts useful. If you have any questions about these discus fish facts please feel free to contact me.